Anna was lead tutor and research coordinator for Teacher Artist Partnership Programme (TAPP). TAPP was a successful professional development programme running in London between 2005 – 2007. Over 40 teachers and artist took part in the programme gaining accreditation at Diploma level from the Institute of Education, University of London. The programme has inspired and informed a number of ‘sister’ programmes such as Eastfeast in Suffolk. TAPP was part of a three-year action research process designed to bring teachers and artists together within a reflective professional development framework to investigate the possibilities and practicalities of working in partnership within the school curriculum. 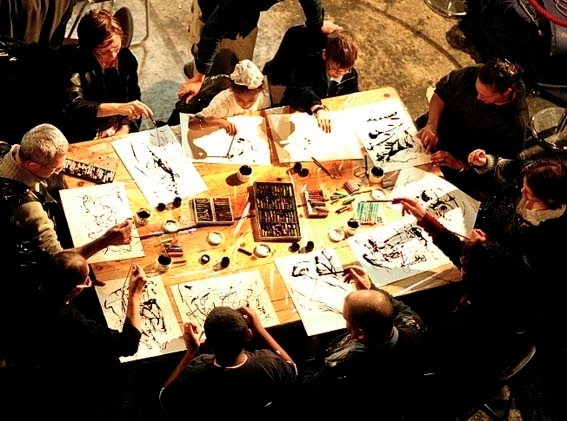 The programme explored approaches to teaching and learning through the experience and practice of the performing arts. TAPP was originally developed by a consortium of leading arts and education organisations which shared a commitment to developing training to support those working in the growing field of arts partnership work. The participants came from a range of educational settings – early years to post 16 – and disciplinary backgrounds. The programme involved regular exploratory development sessions, guided learning and reflection and collaborative action research projects in educational settings as well as an international exchange and was led a small team of tutors and mentors – Anna Ledgard and Tony Fegan from LIFT and Graham Jeffery from Newham Sixth Form College and University of East London. The model is informed by the Continuing Professional Development (CPD) initiatives of LIFT (London International Festival of Theatre) and the Guildhall School of Music and Drama (GSMD), Newham Sixth Form College’s research project Pathways into Creativity, the Animarts Action Research Programme, and CapeUK’s work in supporting partnership based affordable papers pedagogies. ON TAPP is a resource pack compiled by Anna Ledgard with Graham Jeffery to support the professional learning of teachers and artists. The resource is offered as ‘open source’ so they can be adapted and developed to suit a range of settings. All that we ask is that you credit the source and tell us how you are using and adapting them. a selection of stimulus texts. TAPP was supported by Esmee Fairbairn and Paul Hamlyn Foundations, Creative Partnerships, Arts Council Lottery programme, the Innovation Unit (then part of the DfES) and the British Council. We are also grateful of the guidance and feedback which many practitioners and others have given us.